What Causes Cervicogenic Headaches? How is it Different from Migraine? Cervicogenic headaches originate in the cervical spine, or neck. They are classified as secondary headaches; as such,they’re caused by an issue relating to another health problem. These headaches are easily misdiagnosed as migraines or tension headaches, but there are some substantial differences and proper diagnosis is essential to treatment. You may experience headaches at the base of your neck or neck pain and headaches that occur simultaneously with this headache type. Cervicogenic headaches are the result of a variety of issues affecting the neck, ranging from poor posture and occupational hazards to acute injury and fractures or tumors. They are rather common and usually side effects of lifestyle habits, but the key to treating them is being aware that they are a result of a non-head related cause. Therefore, treating the cause is more important than popping a few painkillers. Cervicogenic Headaches: How Are They Different from a Migraine Headache? There are multiple cervicogenic headache causes, and you may never know exactly what yours is. They can be triggered by instantaneous movement or set in from years of maintaining certain positions. Cervicogenic headache symptoms can, at times, feel like migraines or tension headaches, but they do have distinguishing factors. Because they originate in the neck, you may notice pain in the connective areas or a reduced range of motion. Pain that concentrates in one spot, like the back or front of your head, around the eye, etc. The biggest difference between a cervicogenic headache and migraine headache is that the former is a secondary headache and the latter is a primary cause. Cervicogenic headaches are caused by an underlying health issue; migraines are not. Of course, you might not be able to diagnose either on your own. Some of the differences you may notice are that it’s a steady rather than throbbing pain. You also may have some trouble moving your head and neck normally. Additionally, the pain will not shift sides. Essentially, it is a one-sided headache. Also, there may not be any appearance of certain migraine-specific symptoms like light or noise sensitivities. A cervicogenic headache diagnosis should be made by your doctor in order to provide proper treatment. Unlike primary headaches, treating the source of the headache is the priority, so a more intensive process may be required to diagnose. Pressure tests: The doctor will apply pressure manually to certain areas on the neck to see if it produces pain. Blood tests may be required in some cases to see if the pain is a byproduct of disease. Any cervicogenic headache treatments should involve targeting the nerves in the neck, and those methods will vary between individuals. Non-steroidal anti-inflammatory (NSAIDS) medications like aspirin or nerve-blocking medication to handle the acute pain of a cervicogenic headache. Physical therapy, exercise, and massage therapy will be implemented to improve posture and loosen up the neck to take stress off the nerves; cervicogenic headache exercises may work to improve body strength and posture. 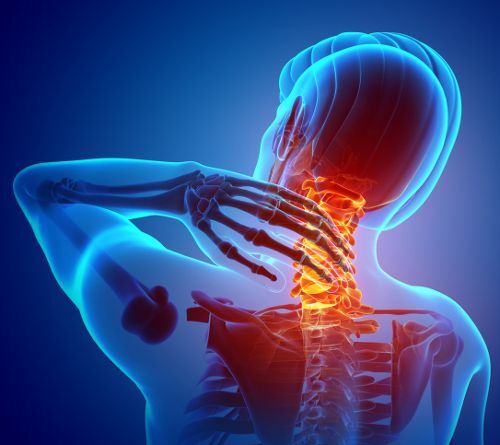 Spinal manipulation may be recommended, which would include work with a physical therapist, chiropractor or osteopath; they may use techniques combining physical therapy, massage and joint-movement/strengthening work. Relaxation techniques like yoga and acupuncture may be recommended, and in some severe cases, surgery may be required. Because posture and positioning play a major role, the best treatment will involve physical therapy and a continuous exercise routine to keep the nerves loose and avoid further trouble. You can lower your chances of neck pain and headaches by working on your posture. If you can draw a straight line from your ears through your shoulders, hips, knees, and ankles, you’ve got good posture. If not, it could be triggering nerve damage in your neck and leading to headaches. You can fix your posture with regular exercise, sleeping on a firm pillow that keeps your head in line with your body, or by simply spending less time sitting and slouched and more time on your feet. Also, bringing your smartphone up to your face instead of looking down at it can be a form of prevention or cervicogenic home treatment. Although there can be acute cases of a cervicogenic headache like whiplash, injury, or a jolt, in many cases, it’s the result of repeated bouts of stress in the neck from poor posture. You can give yourself the best chance of avoiding these headaches by spending time standing straight up on your feet, strengthening your muscles, and improving your posture. If your head is in pain and it doesn’t seem like a migraine, go visit your doctor as soon as possible for a proper diagnosis and treatment prescription. “Cervicogenic Headaches” American Migraine Foundation, October 24, 2016; https://americanmigrainefoundation.org/understanding-migraine/cervicogenic-headache/, last accessed December 15, 2017. Becker, W., “Cervicogenic headache: evidence that the neck is a pain generator,” Headache, April 2010 50(4):699-705; doi: 10.1111/j.1526-4610.2010.01648.x. “What Is a Cervicogenic Headache?” WebMD, December 18, 2016; https://www.webmd.com/migraines-headaches/cervicogenic-headache-facts_#1, last accessed December 15, 2017. Sjaastad, O. and Bovim, G., “Cervicogenic headache. The differentiation from common migraine. An overview,” Functional Neurology, Apr.-June 1991, 6(2):93-100; https://www.ncbi.nlm.nih.gov/pubmed/1916461, last accessed December 15, 2017.